Here are some common questions and answer we've received from visitors to our website and Cabo San Lucas. If your question isn't answered here please don't hesitate to contact us either by email or phone. Whale Watching is an activity for witnessing whales and their behavior in their natural environment for both recreational and scientific purposes. Our tours are organized water-based boat excursions for recreational means. 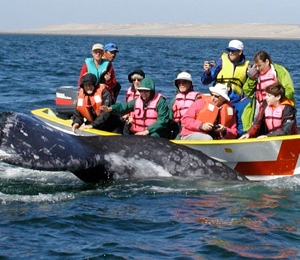 These types of tours originated in this region to observe Gray whales off the shores of San Diego in the nineteen-fifties. From this meager start as a small tourist attraction, whale watching has become a world-wide phenomenon. This estimated two-billion-dollar-per-year industry infuses coastal communities with revenue while offering a viable economic alternative to whaling. Whale Watching tours have contributed to a growing awareness to preserve these endangered cetaceans. Whales are recognized as being some of the most intelligent and social animals on the planet. The money and attention raised on such ecological expeditions can hopefully help to save these majestic marine mammals before it is too late. Depending on the tour, whale watching can last for two hours or for the entire day. We have Whale Watching tours that will fit any schedule. If you are visiting Cabo on a short cruise ship stopover, we can find the right whale watching adventure to fit your itinerary. Is it a safe tour for passengers? What about for the whales? Whale watching is a completely safe activity for all participants. Our vessels and captains are fully licensed and regulated by the government. Our highly-trained captains follow strict guidelines to ensure the safety of both our passengers and the whales. All participants are provided with lifejackets. Our vessels and safety equipment are meticulously inspected on a daily basis. Our captains also make sure that they follow procedures established by established conservation groups and marine biologists to keep the whales safe. Captains are instructed to minimize the impact on the animals routine by maintaining slow speeds, maintaining a safe distance, avoiding surprising or startling the animals, and avoiding direct pursuit, sudden turns or unnecessary noise. Are there any restrictions for your whale watching excursions? Everybody can enjoy the once-in-a-lifetime thrills of witnessing these remarkable creatures in the wild, but some age and health restrictions may apply on certain tours – remember to inquire about this when booking your reservation. When is whale watching season, and why can't we whale watch year 'round? Whale watching season is limited from December through March because that's when these animals migrate to the warm waters off the Baja Peninsula. Whales spend the remainder of the year in cooler waters in places like the Bering Sea off the coast of Alaska. Simply wear comfortable clothing that is appropriate for the weather that day. Generally, the weather is clear and hot off the shores of Los Cabos, but participants may want to bring a jacket just in case. On some of these excursions, clients may possibly get wet, so please wear the appropriate clothing and be prepared to protect any electronics. The sun, both from the sky and from the reflection off the water can be strong, so be sure to bring the proper sun and eye protection, including sun block, sunglasses, and a hat. Are there different types of whale watching tours? We offer a wide variety of whale watching excursions to suit any need. We offer sailing tours on both catamarans and typical sloops. We have tours on smaller maneuverable motorized zodiacs as well as on large cruise ships with full facilities. We have tours that emphasize a more ecological emphasis, while others concentrate more on the comfort of the passenger. Our tours also vary in length, travel time, and intensity. Some of our tours include round-trip transportation from designated departure points throughout Los Cabos, but all of our tours leave the dock in downtown Cabo San Lucas Marina. Make sure that you arrive at these pick-up points or departure areas well ahead of the departure time. Our friendly, English-fluent naturalist guides will be waiting to take you on an eco-adventure that you won't ever forget.